. : Optics & Photonics Focus :: Imaging through Scattering Media :. Quantum physics and general relativity have completely changed our understanding of nature — however, these two theories sometimes deliver contradictive results. A new proposal may finally be able to shed light on this issue. 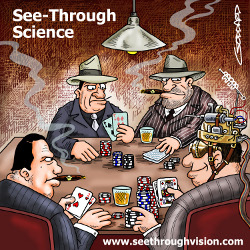 See-through science. Allard Mosk (1970) received his Ph.D. from the University of Amsterdam in 1999. Since 2002 he has been a member of the Complex Photonic Systems (COPS) group at the MESA+ Institute for Nanotechnology at the University of Twente in the Netherlands. His main fields of research are atomic quantum gases, thermodynamics, optics, and nanophotonics. His method has always been to complement experiments with deep theoretical knowledge of the phenomena involved. He enjoys enthusiastically presenting science to specialist and non-specialist audiences alike, and especially to students. With the support of the COPS group he has pioneered wavefront shaping to control light in opaque scattering media, an experimental method that many prominent groups worldwide are now following. How would you define the field of imaging and light propagation through a scattering medium? What qualifies a medium as scattering? Could you identify some scientific and technological milestones that kicked off research in this field? Could you take us through a short history of the field? How did it develop? Looking through an opaque material. In an experiment recently published in Nature, Allard Mosk and colleagues have succeeded in obtaining sharp pictures of objects hidden behind an opaque screen. (a) The test object used was the Greek letter ?, written in fluorescent ink. The test object was covered by a strongly scattering ground-glass diffuser that completely hid it from view. (b) A laser beam was then scanned at an angle, always hitting the diffuser in the same spot. The test object only yielded a diffuse glow of fluorescent light. (c) The intensity of this fluorescence versus the angle of the laser beam were measured and recorded by a computer. The seemingly random pattern bears no resemblance to the test objects. (d) The computer then searched for similarities in the measured pattern, which were used to calculate the true shape of the test object. The research coming from the field at the moment seems to be in the media spotlight. This would probably not have been the case in the initial stage. What were the main difficulties you encountered at the beginning? The recent Nature article you have coauthored with other researchers in the Netherlands and Italy demonstrates the possibility of taking sharp images of an object hidden by a turbid medium . How does this work place itself within the field? What are the main applications and outcomes you expect from the field? The ability to see through turbid media brings superheroes or spy movies to mind. This may well sound like a cliché, since, as always, reality would seem to be much more complex and limited than fiction. Could you comment on this statement? Keeping with the cliché side of this story… Are you more of a James Bond or more of a Superman kind of guy? To conclude, what do you envision lying ahead for this field? E. N. Leith & J. Upatnieks, Holographic imagery through diffusing media, J. Opt. Soc. Am. 56, 523 (1966). Z. Yaqoob, D. Psaltis, M. S. Feld & C. Yang, Optical phase conjugation for turbidity in biological samples, Nature Photon. 2, 110-115 (2008). I. M. Vellekoop & A. P. Mosk, Focusing coherent light trough opaque strongly scattering media, Opt. Lett. 32, 2309-2311 (2007). S. M. Popoff, G. Lerosey, R. Carminati, M. Fink, A. C. Boccara & S. Gigan, Measuring the transmission matrix in optics: an approach to the study and control of light propagation in disordered media, Phys. Rev. Lett. 104, 100601 (2010). 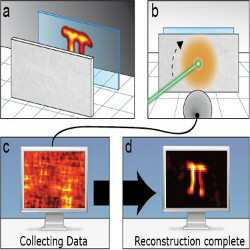 J. Bertolotti, E. G. van Putten, C. Blum, A. Lagendijk, W. L. Vos & A. P. Mosk, Non-invasive imaging through opaque scattering layers, Nature 491, 232-234 (2012). Y. Choi, T. D. Yang, C. Fang-Yen, P. Kang, K. J. Lee, R. R. Dasari, M. S. Feld & W. Choi, Overcaming the diffraction limit using multiple light scattering in a highly disordered medium, Phys. Rev. Lett. 107, 023902 (2011). E. G. van Putten, D. Akbulut, J. Bertolotti, W. L. Vos, A. Lagendijk & A. P. Mosk, Scattering lens resolves sub-100 nm structures with visible light, Phys. Rev. Lett. 106, 193905 (2011). I. M. Vellekoop, A. Lagendijk & A. P. Mosk, Exploiting disorder for perfect focusing, Nature Photon. 4, 320-322 (2010).